This dress had strangers calling me Cinderella when I walked past! A truly beautiful gown that is not done justice through photos. The floral lace bodice has pearls and diamontes with sequins running throughout the bodice and skirt to really make you sparkle. On your chest is sheer fabric with florals and diamontes dripping through. The 3m train is long and grand, but has 3 hooks to hang up while dancing. The veil is even slightly longer and is included with the dress. 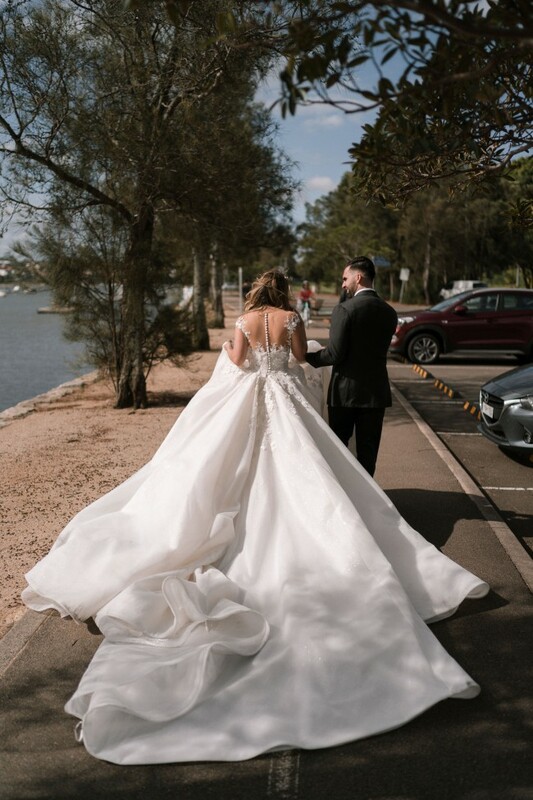 The back of the gown is just as beautiful, with florals dripping over the sheer fabric and buttons running to the top of your neck, making the gown suitable for any hairstyle. The gown is also equipped with a belt to really tighten the bodice around you and accentuate your waist, however buckling it is optional. This gown is both grand but also sweet and romantic. I felt like a princess the whole day and night and I cannot wait for another bride to feel the same way. The gown has been dry cleaned, and has been professionally looked over and restored to ensure it is in original condition.